As part of the demerger of Talon Petroleum Limited (ASX:TPD) from Texon Petroleum Ltd (ASX:TXN), a ruling was sought from the Australian Taxation Office (ATO) on the taxation implications for shareholders. Texon Petroleum Ltd (ASX:TXN) advises that the proposed scheme of arrangement under which Texon will be acquired by Sundance Energy Australia Limited (ASX:SEA, Sundance) (Acquisition Scheme) was implemented today. Texon Petroleum Ltd (ASX:TXN) advises that the proposed scheme of arrangement under which Talon Petroleum Limited will be demerged from Texon (Demerger Scheme) was implemented today. Texon Petroleum Ltd (ASX:TXN) advises that the Federal Court of Australia has today made orders approving the proposed schemes of arrangement under which Talon Petroleum Limited (Talon) will be demerged from Texon (Demerger Scheme) and Texon will be acquired by Sundance Energy Australia Limited (ASX:SEA, Sundance) (Acquisition Scheme). Texon Petroleum Ltd (ASX:TXN) Chairman&apos;s address Aquisition meeting today. Texon Petroleum Ltd (ASX:TXN) refers to the notice of extraordinary general meeting attached to the Demerger Scheme Booklet released to ASX on 22 January 2013 and advises that the Chairman intends at that meeting (which will be held on 25 February 2013) to note a minor correction to Resolution 1 in that notice which will replace the reference to "Effective Date" in the fifth line of that resolution with a reference to "Implementation Date". Texon Petroleum Ltd (ASX:TXN) are pleased to provide the 31 December 2012 Quarterly Report. Texon Petroleum Ltd (ASX:TXN) advises that the Demerger Scheme Booklet, Acquisition Scheme Booklet and accompanying proxy forms which were released to ASX on Tuesday, 22 January 2013 have now been mailed to Texon shareholders. On 13 November 2012, the Board of Texon Petroleum Limited (ASX:TXN) announced two separate proposals designed to provide value for Texon shareholders. They are: a proposal to demerge by scheme of arrangement and list a Texon subsidiary, Talon Petroleum Limited (Talon), which would hold Texon&apos;s non Eagle Ford Shale (EFS) assets. proposal for Sundance Energy (ASX:SEA) to acquire by scheme of arrangement, after the implementation of the Demerger Scheme, all Texon shares in return for one new Sundance share for every two Texon Shares held at the record date. The Texon-Quintanilla SMEF 1H (Texon Petroleum&apos;s(ASX:TXN) 7th Eagle Ford well) has tested at rates of 1,503 bopd and 1,270 mcfgpd (1,705 boepd) on a 22/64th choke with flowing tubing pressure of 2,665 psi. The Texon-Hoskins 3H (Texon Petroleum&apos;s (ASX:TXN) 6th Eagle Ford well) has tested at rates of 1,751 bopd and 1,537 mcfgpd (2,007 boepd) on a 22/64" choke with flowing tubing pressure of 3201 psi. The well spudded on 21 October 2012 and drilled to 17,156&apos; MD (11,267&apos; TVD) total depth. It was fracced with 24 stages - a correction from the previously announced 22 stages. Texon Petroleum Ltd (ASX:TXN) report that the recently drilled and cased Texon-Hoskins EFS #3H well (Texon&apos;s 6th Eagle Ford well) has been fracture stimulated for production testing. Twenty two (22) frac stages have been successfully pumped in the 5,592&apos; horizontal lateral. As foreshadowed at the Texon Petroleum Ltd (ASX:TXN) EGM on 31 August 2012, senior secured short term funding of $25m at an interest rate of 20% pa payable six monthly has been finalised. The funding, which is for a period of 12 months has been provided by a consortium of lenders who were issued non-convertible loan notes as security by the Company. Texon Petroleum Ltd (ASX:TXN) previously announced in the 30 November ASX release, Hoskins #4H, the eighth Texon Eagle Ford well commenced drilling operations on 6 December 2012. The Hoskins #4H well, a lease obligation well is planned for a lateral length of 7420 ft. at a measured depth of 18,800 ft, at a true vertical depth of 11,340 ft. Fraccing operations are planned to begin in late January 2013 pending crew and equipment availability. Texon Petroleum Ltd&apos;s (ASX:TXN) Hoskins EFS #3H well was drilled to 17,156 ft measured depth at a true vertical depth of 11,267 ft after which production casing was installed to total depth. The well was successfully drilled in the EFS target zone for a lateral length of 5,595 ft. The pre-drill estimate of 18 frac stages has been modified to the actual hole conditions and it is now estimated that there may be as many as 25 frac stages in the well. Texon Petroleum Ltd (ASX:TXN) are pleased to provide a presentation regarding the proposed demerger of Talon Petroleum Ltd ("Talon") * and the merger of Texon Petroleum with Sundance Energy Australia Limited. The Boards of Texon Petroleum Limited (ASX:TXN) and Sundance Energy Australia Limited (ASX:SEA) are pleased to announce that they have agreed to the proposed Merger of Texon with Sundance via a scrip transaction that provides a unique consolidation opportunity with significant benefits for shareholders of both companies. 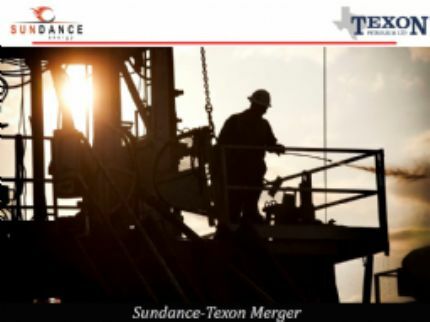 Texon Petroleum Ltd (ASX:TXN) are pleased to provide a presentation regarding the Sundance Texon Merger Presentation. Texon Petroleum Ltd (ASX:TXN) provide an update on the current drilling program. Texon Petroleum Ltd&apos;s (ASX:TXN) net average daily production in the September quarter of 571 boepd was an increase on the Company&apos;s June quarter average of 371 boepd, mainly attributable to the added production from the Company&apos;s fifth Eagle Ford well (Peeler #1H) and the Wheeler #1 Olmos well being brought on stream during the quarter. Texon Petroleum Ltd (ASX:TXN) The Company is continuing to progress a potential transaction, and in parallel is aiming to enhance the value of the EFS holding by further drilling set out in this update. 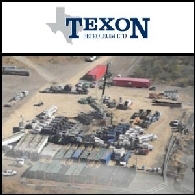 Texon Petroleum Ltd (ASX:TXN) has acquired a 50% Working interest in the Roundhouse Prospect located in Navarro County, Texas which encompasses 7,038 gross acres (3,519 net acres) of Cotton Valley Lime reservoir potential from private US oil and gas company Tanos Energy Holding, LLC. Tanos will remain operator with 50% working interest in the prospect. At 1 August 2012, reserves attributable to Texon Petroleum Ltd&apos;s (ASX:TXN) NRI are as in the following table. (See release). The total of 12.58 mmboe is an 11% increase on the 11.33 mmboe at year end 2011 (after adjusting the year end 2011 reserves of 12.88 mmboe for the sale in March 2012 of the Leighton Olmos and Yegua reserves of 1.55 mmboe). The attached Texon Petroleum Ltd (ASX:TXN) presentation provides an update of the Company&apos;s projects and will be presented to the Extraordinary General Meeting today. Texon Petroleum Ltd (ASX:TXN) advises that its recently drilled Mosman-Rockingham Olmos well (Wheeler #1) has now been placed into full production with the completion of production facilities last week. Production tubing has been set and the well is flowing on a restricted rate of 168 bopd and 108 mcfgpd (186 boepd) with 1,300psi flowing tubing pressure on an 8/64" choke. Texon plans to observe the well on this restricted choke to ensure the well does not flow frac sand at this setting. If the well does not produce any sand, the choke will be opened further to increase the oil flow rate. Texon Petroleum Ltd (ASX:TXN) is pleased to provide the June 2012 Quarterly Report and App 5B. Texon Petroleum Ltd (ASX:TXN) advises that its fifth Eagle Ford well (Peeler EFS #1H) has tested at the rates of 1,072 bopd and 1.137 mmcfgpd (1,262 boepd) on an 18/64" choke at a flowing pressure of 2,794 psi. Texon Petroleum Ltd (ASX:TXN) Investor Update: Eagle Ford Transaction Progress. In February, the Company announced that it had appointed Houston based Albrecht & Associates, Inc. and Brisbane based RBS Morgans Limited with the intention to either fully or partially monetize the Company&apos;s Eagle Ford to achieve the optimal outcome for shareholders. In the Chairman&apos;s March 2012 letter, there is reference to a target completion date of mid-2012. Texon Petroleum Ltd (ASX:TXN) advises that its fifth Eagle Ford well, Peeler EFS #1H (a lease commitment well), is on schedule to begin its fraccing operation on July 10th. The well reached its total depth of 14,795 feet 2-3 weeks ago after drilling 4,200 feet of horizontal Eagle Ford section with good oil and gas shows. Texon Petroleum (ASX:TXN) advises that its recently drilled Mosman-Rockingham Olmos well (Wheeler #1) has begun to flow oil and gas at the rate of 220 boepd comprising 87% oil (193 bopd) and 160 mcf of gas per day (27 boepd). The attached presentation provides an update of Texon Petroleum Limited&apos;s (ASX:TXN) projects and will be presented to the Annual General Meeting today. It was prepared by Mr Clifford S. Foss Jr who was appointed CEO of Texon in December last year and who brings extensive and successful Texas Gulf Coast experience to the Company. Texon Petroleum Ltd (ASX:TXN) advises that its fifth Eagle Ford well, Peeler EFS #1H (a lease commitment well), has reached its total depth of 14,795 feet, after drilling some 4,200 feet of horizontal section. On the 22nd of May, Texon Petroleum Ltd (ASX:TXN) announced that the logs in the Wheeler #1 Olmos well indicated 23 feet of pay with good porosity and oil and gas shows. Texon advises that the well is now scheduled to be fracced about the 6th-10th of June. Texon Petroleum Limited&apos;s (ASX:TXN) Wheeler #1 well has reached its total depth of 9,200 feet and electric logs indicate 23&apos; of net pay. Texon Petroleum Ltd&apos;s (ASX:TXN) fifth Eagle Ford well, Peeler EFS #1H (a lease commitment well), is drilling at a depth of 7,035 feet in the vertical part of the well, prior to drilling the horizontal section of the well. The Texon Petroleum Ltd (ASX:TXN) Wheeler #1 well has reached a depth of 7,604 feet. The proposed total vertical depth of 9,200 feet is expected to be reached early next week at which time logs will be run. If productive oil pay is indicated, the well will be cased in readiness for fraccing and testing operations. Texon Petroleum Ltd&apos;s (ASX:TXN) fifth Eagle Ford well, Peeler EFS #1H (a lease commitment well), began drilling operations on 6 May 2012. The well is expected to take 25 days to reach its total depth after drilling 4,200 feet of horizontal section. The well will then be cased, fracced and connected for production. Texon Petroleum Ltd (ASX:TXN) advises that the Wheeler #1 well began drilling operations on 6 May 2012 toward a proposed vertical depth of 9,200&apos;. The well is expected to take 20 days to reach its total depth. Texon Petroleum Ltd (ASX:TXN) is pleased to provide its Quarterly Activity Report for the quarter ended 31 March 2012. 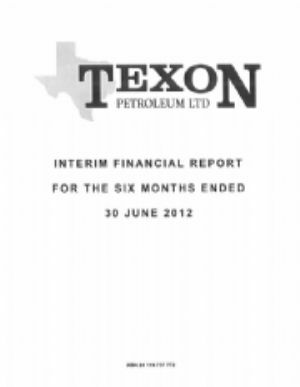 The directors present their report together with the financial report of Texon Petroleum Ltd (ASX:TXN) and of the Group, being the Company and its subsidiaries, for the financial year ended 31 December 2011 and the auditor&apos;s report thereon. Texon Petroleum Ltd (ASX:TXN) advises that the Company&apos;s fifth Eagle Ford well (a lease commitment well) is scheduled to commence drilling by the end of April. It is expected that the well will take 45 days to drill with fraccing and completion for production to follow. In the Texon Petroleum Ltd (ASX:TXN) Chairman&apos;s letter to shareholder&apos;s dated 15 March 2012 there was reference to the review of newly acquired 3D seismic which would aid an understanding of the Olmos oil reservoir potential of the Company&apos;s Mosman-Rockingham leases. Texon Petroleum Ltd (ASX:TXN) announce the Financial Report for the year ending December 31, 2011. The Company?s beneficial production for the year was 295.0 mboe (2010: 145.3 mboe). The rate of production increased by 103% from 398boepd to 808boepd. During the year there were 20 producing wells including four Eagle Ford wells. Texon Petroleum Ltd (ASX:TXN) - The following letter to shareholders provides an update of the Company&apos;s projects and will be distributed to shareholders on 15 March 2012. Texon Petroleum Ltd&apos;s (ASX:TXN) (PINK:TEXOF) year end 2011 Proved, Probable and Possible Eagle Ford reserves are 11.33 mmboe, an increase of 125% compared with year end 2010. Texon Petroleum Ltd (ASX:TXN) (PINK:TEXOF) advises that it has closed a Purchase and Sale Agreement with a USA based company whereby Texon has sold its holdings in the Leighton area Olmos reservoir. Texon Petroleum Ltd (ASX:TXN), in regard to yesterday&apos;s release on this project, the attached "Flyer" was made available at the North American Prospect Exposition ("NAPE") being held this week (23/24 February) in Houston, Texas, USA. Texon Petroleum Ltd (ASX:TXN) advises that it has appointed Albrecht & Associates, Inc. and RBS Morgans Limited to seek potential buyers for all or part of the Company&apos;s 7,200 acre Eagle Ford oil project. Texon Petroleum Limited (ASX:TXN) is pleased to provide a quarterly report for the period ended 31 December 2011. At the time of Texon Petroleum Ltd&apos;s (ASX:TXN) release yesterday, it was thought that production from its first Wilcox well (Hoskins No. 2 (Wilcox)) had stabilized. However, the well has improved and over the following 24 hours flowed at 55 bopd. Texon Petroleum Ltd&apos;s (ASX:TXN) first Wilcox well (Hoskins No. 2 (Wilcox)) is producing oil at the rate of 37 bopd (370 API). Texon has a 95% WI (71.25% NRI) in the well. Texon Petroleum Ltd (ASX:TXN) advises that it has acquired a further 480 acres of Eagle Ford leases. This takes Texon&apos;s Working Interest Eagle Ford holdings to 7,200 acres out of a gross 7,700 acres. Texon&apos;s (ASX:TXN) fourth Eagle Ford well (Hoskins EFS #1H) produced 41,606 boe (35,530 bo + 36,455 mcfg) during its first 60 days of production. This is an average daily rate of 693 boepd of which some 90% is oil and gas liquids. Texon Petroleum Ltd (ASX:TXN) advises that Mr David Mason, 2007 IPO founding CEO of the Company will retire as CEO on the 30th of November 2011. Mr Mason has seen the Company grow its beneficial production to about 1,600 boepd in recent weeks and achieve an important holding in the Eagle Ford oil and gas resource play in Texas. On behalf of shareholders, the Board records its appreciation of Mr Mason&apos;s contributions over the last four years and wishes him well in his future endeavours. Mr Mason will remain on the Board of the Company. Since the Chairman&apos;s Letter of 18th August, Texon Petroleum Ltd (ASX:TXN) has drilled, tested and is producing oil and gas from two (2) new Eagle Ford wells, both of which in early production are better than the Company&apos;s first two Eagle Ford wells. The performance of these wells indicates an improved understanding of the acreage and its geological and engineering characteristics. The Company has acquired an additional 830 acres (100% Working Interest) taking its total Eagle Ford holding to 6,734 WI acres. The Wilcox interval currently being tested is the deepest of several Wilcox zones that have oil or gas shows in this well. Texon plans to fracture stimulate the current zone and one immediately above it as soon as a stimulation company can be scheduled. Texon Petroleum Limited (ASX:TXN) is pleased to announce the following regarding the New Texon - Wandoo Prospect Generation Agreement. Texon Petroleum Ltd (ASX:TXN) advises that its fourth Eagle Ford well (Hoskins EFS #1H) produced 23,780 boe (20,969 bo + 16,875 mcfg) during its first 30 days of production. Texon Petroleum Ltd (ASX:TXN) advises that its third Eagle Ford Well, Tyler Ranch EFS #2H, has produced 38,677 bo + 31,329 mcfg over 60 days. This represents an average daily rate of 732 boepd (645 bopd + 522 mcfgpd) on the basis of 6mcf of gas converting to 1 barrel of oil equivalent. Texon Petroleum Limited&apos;s (ASX:TXN) Wilcox well test (Hoskins No. 2 (Wilcox)) which was to have occurred this week has been delayed and is now scheduled for the middle of next week. Texon Petroleum Limited (ASX:TXN) advises that it has appointed Houston based Albrecht & Associates to seek buyers for Texon&apos;s Olmos production and related leases. This possibility was raised in the Chairman&apos;s letter to Shareholders dated 18 August 2011. 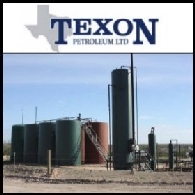 Texon Petroleum Ltd (ASX:TXN) advises that it has acquired a further 830 acres of Eagle Ford leases at less than $2,000 per acre. Texon Petroleum Ltd (ASX:TXN) announces that its fourth Eagle Ford well (Hoskins EFS #1H) has flowed oil and gas at the rates of 1,408 bopd and 922 mcfgpd (combined 1,562 boepd (6)) at a pressure of 3,050 psi through a 18/64" choke. This is a similar flow rate and pressure to the Company&apos;s #3 Eagle Ford well, but on a larger choke which is encouraging. Texon Petroleum Ltd (ASX:TXN) advises that its fourth Eagle Ford well (Hoskins EFS #1H) has been successfully fracced over 16 stages using the same operational procedures as were applied to our third Eagle Ford well (Tyler Ranch EFS #2H). 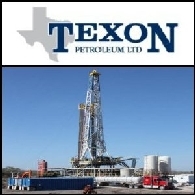 Texon Petroleum Ltd (ASX:TXN) advises that during its first 30 days of production, the Company&apos;s third Eagle Ford well (Tyler Ranch EFS #2H) produced 30,400 boe (92% oil). This is some 50% more than our first Eagle Ford well (Tyler Ranch EFS #1H) which produced 19,651 boe in its first 30 days. Texon Petroleum Ltd (ASX:TXN) advises that the 30 day production information for its third Eagle Ford well (Tyler Ranch EFS #2H) (i.e. 30 days since stabilized flow was established after the Initial Production test) will be available next week. Texon Petroleum Ltd (ASX:TXN) advises that fraccing of its fourth Eagle Ford well (Hoskins EFS #1H) began on the 2nd of October. Texon Petroleum Limited&apos;s (ASX:TXN) first Wilcox well (Hoskins No. 2 (Wilcox)) has been drilled and logged. The well has been cased ready for testing. Texon Petroleum Limited&apos;s (ASX:TXN) fourth Eagle Ford well (Hoskins EFS #1H) was scheduled to begin fraccing operations on the 26th of September 2011. Texon Petroleum Limited (ASX:TXN) advises that its Iluka well (Scherer #1) has flowed gas and oil at the rates of 1.23 mmcfgpd and 31 bopd (236 boepd (6)) through a 9/64" choke at a pressure of 2,640 psi. 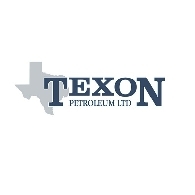 On 31st August, Texon Petroleum Limited (ASX:TXN) announced that its third Eagle Ford well (Tyler Ranch EFS #2H) had flowed at the rates of 1,488 bopd and 700 mcfgpd (combined 1,605 boepd (6)) at a pressure of 3,000 psi through a 16/64" choke. Texon Petroleum Limited&apos;s (ASX:TXN) first Wilcox well (Hoskins No. 2 (Wilcox)) to test oil shows observed during drilling Wilcox sands in several of its Leighton, Mosman and Rockingham area wells, spudded on the 7th of September. Texon Petroleum Limited (ASX:TXN) announces that its third Eagle Ford well (Tyler Ranch EFS #2H) has tested oil and gas at the rates of 1,488 bopd and 700 mcfgpd (combined 1,605 boepd (6)) through a 16/64" choke at a flowing tubing pressure of 3,000 psi. Texon Petroleum Limited (ASX:TXN) advises that its Iluka well (Scherer #1) has reached its total depth of 6,750 feet. Texon Petroleum Limited&apos;s (ASX:TXN) reserves are dominated by its Eagle Ford holdings. At mid year 2011, the Company&apos;s Eagle Ford reserves were assessed by Netherland, Sewell & Associates, Inc. For the rest of the Company&apos;s oil and gas properties, the mid year reserves are taken to be the 2010 year end reserves (determined by Delilah B Hainey of Hainey & Hainey, a reservoir consultant to the Company), less production in the first half of 2011. Texon Petroleum Ltd (ASX:TXN) provides a report with production information from its first two Eagle Ford wells. Texon Petroleum Limited&apos;s (ASX:TXN) fourth Eagle Ford well (Hoskins EFS #1H) has reached its total depth of 16,400&apos; after drilling a horizontal section of 4,800 feet in the Eagle Ford with good oil and gas shows throughout the horizontal section. Texon Petroleum Limited (ASX:TXN) advises that its third Eagle Ford well (Tyler Ranch EFS #2H) has been successfully fracced over 17 stages and will now be tested. The recovery of frac fluid will probably take a few days after which the Company will be able to conduct a proper flow test of the well. Texon Petroleum Limited (ASX:TXN) releases the following letter to shareholders, which provides an update of the Company&apos;s projects and will be posted to shareholders on Monday 22 August 2011. Texon Petroleum Limited (ASX:TXN) advises that its recently drilled Peeler #3 (refer to Texon release of 21 July 2011) has begun to flow oil and gas at the gross combined rate of 370 boepd from the Olmos reservoir (comprising 325 bopd and 268 mcfgpd). This is the eleventh well in the Leighton Olmos oil and gas field, all of which have been successful producers. 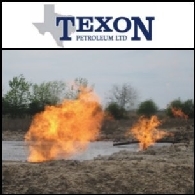 Fraccing and testing operations on Texon Petroleum Limited&apos;s (ASX:TXN) third Eagle Ford well (Tyler Ranch EFS #2H) began on 8th August, 2011. The project involves 17 stages(compared with 15 in the Company&apos;s first Eagle Ford well), with fraccing expected to take about a week followed by testing. Earlier this year Texon Petroleum Limited (ASX:TXN) had expected to be drilling this prospect in June. However just before the Company&apos;s AGM in May, it became clear that Coolangatta leasehold title would not be cleared and drill-ready by that time. The Company then initiated a report on the matter by an independent lease and land management advisor. After examining the report, and reviewing the situation with Texon Houston based personnel, the Company is now satisfied that the leasehold title should be finalized and drill-ready by the end of November this year. Texon Petroleum Limited (ASX:TXN) advises that the Iluka well (Scherer #1) spudded on the 1st of August. Texon Petroleum Limited&apos;s (ASX:TXN) fourth Eagle Ford well (Hoskins EFS #1H) spudded on the 30th of July. 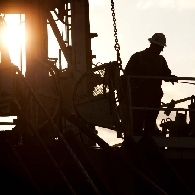 Texon Petroleum Limited&apos;s (ASX:TXN) third Eagle Ford well has reached its total depth of 15,767 feet after successfully drilling 4,500&apos; of horizontal well in the Eagle Ford reservoir. Texon Petroleum Limited (ASX:TXN) advises that Peeler #3 has reached its total vertical depth of 2,774 metres (9,100 feet). This is the eleventh well in the Leighton oil and gas field - all of which are successful oil and gas producers. Texon Petroleum Limited&apos;s (ASX:TXN) first Eagle Ford well has now been in production for six months and during this period, 81,000 boe were produced - some 77% of the forecast for this period from the production model which forecasts 475,000 boe over the life of the well. The 6 month production outcome correlates with a well life production of 425,000boe. Texon Petroleum Limited (ASX:TXN) today releases the following report regarding the company progress and production activities. Texon Petroleum Limited (ASX:TXN) advises that the 11th Leighton Olmos vertical production well (Peeler #3) commenced drilling on the 15th of June 2011. The well has a planned total depth of 2,743 metres (9,000 feet) and will take some 15 days to drill and run production casing. Fracture stimulation and testing of the well are scheduled for August. Texon Petroleum Limited&apos;s (ASX:TXN) third horizontal Eagle Ford (TR EFS #2H) commenced drilling on the 12th of June. The well is located on the Company&apos;s Leighton lease just to the north of Texon&apos;s first Eagle Ford well which tested at an initial rate of 1,200 bopd. The well will have a 4,500 feet horizontal section similar to Texon&apos;s first two Eagle Ford wells and it is expected that drilling and casing operations will take 35 days. In our release of 18th April, Texon Petroleum Limited (ASX:TXN) advised that it expected to begin the third Eagle Ford well in mid May. Texon advises that its third Eagle Ford well to be drilled in the Leighton area is now due to commence drilling by mid June, due to the late arrival of the rig from another operator. Texon Petroleum Limited (ASX:TXN) advises that its second Eagle Ford Well, Teal EFS #1H, has produced 16,531 boe (14,024 bo + 15,043 mcfg) over its first 30 production days. Texon Petroleum Limited (ASX:TXN) advises that it has secured a rig for its third and fourth Eagle Ford horizontal wells, Tyler Ranch EFS #2H and Hoskins EFS #1H, which will be drilled on its Leighton and Rockingham leases respectively. Texon Petroleum Limited (ASX:TXN) advises following the recent successful production testing of its second Eagle Ford well and three Leighton Olmos wells, the total gross production from Texon&apos;s sixteen producing wells is in excess of 2,100 boepd, with Texon&apos;s nett beneficial interest being in excess of 1,200 boepd (made up of 840 bopd and 2,380 mcfgpd). 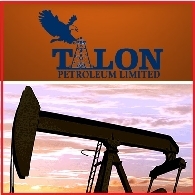 Texon Petroleum Limited (ASX:TXN) advises that its second Eagle Ford well, Teal Ranch EFS #1H, has flowed 1,228 boepd representing 1,105 bpd of light sweet crude oil and 736 mcfpd of gas with a flowing tubing pressure of 2086 psi through a 18/64" choke. Some of the frac fluid is also still being recovered. The test of Texon Petroleum Limited&apos;s (ASX:TXN) second Eagle Ford well is proceeding satisfactorily with the well flowing oil and gas and water (probably frac fluid). The oil and gas rates are in line with Texon&apos;s first Eagle Ford well at this stage of the test. Texon Petroleum Limited (ASX:TXN) advises that the Share Purchase Plan (SPP) which was announced on 4 March and closed on 6 April has raised A$23.7m. Shareholders applied for 36.5m shares at an issue price of 65 cents which was discounted by 14.7% to the average of the closing prices of Texon&apos;s shares over the last five trading days before the announcement made on 23 February 2011. The offer was underwritten by RBS Morgans up to A$10.5m. On a number of occasions Texon Petroleum Limited (ASX:TXN) has advised shareholders and potential investors about oil shows observed in Wilcox sands in several of its Leighton, Mosman, Rockingham, Sutton area wells. Analysis of electric logs and side wall cores suggests that a significant footage of Wilcox pay could be present in some parts of the Company&apos;s LMRS leases. Texon Petroleum Limited (ASX:TXN) advises that two of its recently drilled 3 Olmos wells on its Leighton Project, (Peeler #2 and Tyler Ranch #8) have begun to flow oil and gas at the gross combined rate of 550 boepd from the Olmos reservoir (comprising 435 bopd and 689 mcf of gas per day). Texon Petroleum Limited (ASX:TXN) advises that the frac and test work on its second Eagle Ford horizontal well (Teal EFS #1H) announced on 23 March 2011 is progressing well. Texon Petroleum Limited (ASX:TXN) announced company reserves at the end of 2010. The reserves position is substantially increased since YE2009 with a further increase to occur by YE2011 if EFS-2 flows oil and gas in the near future, and the two mid 2011 EFS wells, and 2011 exploratory projects Coolangatta and Scarborough are successful. Fracture stimulation and testing of Texon Petroleum Limited&apos;s (ASX:TXN) second Eagle Ford horizontal well (Teal EFS #1H) commenced on Tuesday 22 March 2011 (Houston time). Texon Petroleum Limited (ASX:TXN) is to test 4 wells in March 2011. Texon Petroleum Limited (ASX:TXN) advises that Tyler Ranch #8 has reached its total depth of 2,774 metres (9,100 feet). This is the tenth well in the Leighton oil and gas field - all of which have been successful. Texon Petroleum Ltd (ASX:TXN) announces that its Share Purchase Plan (SPP) has opened for eligible shareholders in Australia and New Zealand to subscribe for up to A$15,000 worth of shares in the Company at an issue price of 65 cents. The offer will close at 5PM (Brisbane time) on Wednesday 6 April 2011. The issue price is the same as the recent successful placement to sophisticated and institutional investors which raised A$15.7m and represents a discount of 14.7% to the average of the closing prices of Texon&apos;s shares over the last five trading days before the announcement made on 23 February 2011. RBS Morgans is the lead manager for the SPP and is underwriting the offer up to A$10.5m. Texon Petroleum Limited (ASX:TXN) announces that it has successfully completed a placement of 24,166,681 million shares to sophisticated and institutional investors at an issue price of A$0.65 per share to raise approximately A$15.7 million. The placement, was very strongly supported by existing shareholders, institutional and sophisticated investors. RBS Morgans was the Lead Manager to the placement with the support of Patersons Securities Limited. Texon Petroleum Limited (ASX:TXN) advises that it has secured lease agreements to purchase 1,140 acres near its Leighton / Mosman / Rockingham / Sutton ("LMRS") leases and which are prospective for oil and gas in the Eagle Ford. Texon Petroleum Limited (ASX:TXN) advises that Peeler #2 ("P#2") has reached its total depth of 2,774 metres (9,100 feet). This is the ninth well in the Leighton oil and gas field - all of which have been successful. The Olmos in P#2 has similar reservoir characteristics to the Olmos in the previous eight (8) Leighton wells. Texon Petroleum Limited (ASX:TXN) advises that it has had encouragement from a log analysis by NuTech of the Wilcox Formation in one of its recent wells. The NuTech analysis indicates pay in the interval where oil and gas shows were observed during drilling. Texon Petroleum Limited (ASX:TXN) advises that its first Eagle Ford Well, Tyler Ranch EFS #1H, has produced 31,099 bo + 40,987 mcfg over 60 days on a restricted choke. This represents an average daily oil equivalent rate (without taking into account the high calorific value of the gas) of 632 boepd (518 bopd + 683 mcfgpd) converting gas on the basis that 6 mcf of gas equals 1 barrel of oil equivalent. Texon Petroleum Limited (ASX:TXN) provide March 2011 testing updates on its four wells. Texon Petroleum Limited (ASX:TXN) advises that Tyler Ranch #7 ("TR#7") has reached its total depth of 2,774 metres (9,100 feet). This is the eighth production well in the Leighton oil and gas field - all of which have been successful. Texon Petroleum Limited (ASX:TXN) advises that its first Eagle Ford Well, Tyler Ranch EFS #1H, has produced 24,862 bo + 32,006 mcfg over 45 days on a restricted choke. This represents an average daily oil equivalent rate of 671 boepd (552 bopd + 711 mcfgpd) on the basis that 6mcf equals 1 barrel of oil equivalent. Texon Petroleum Limited (ASX:TXN) advises that the gross production from its 12 producing wells has recently averaged 1,200 boepd (818 bopd and 4,591 mcfgpd). Texon Petroleum Limited (ASX:TXN) advises that its first Eagle Ford Well, Tyler Ranch EFS #1H, has produced 19,651 boe (17,814 bo + 22,052 mcfg) over 30 days on a restricted choke. This represents an average daily oil equivalent rate of 655 boepd (594 bopd + 735 mcfgpd). Texon Petroleum Limited (ASX:TXN) is pleased to announce that with the Company&apos;s planned drilling activity in the Leighton/Mosman/Rockingham/Sutton leases and the increasing Eagle Ford drilling activity anticipated in surrounding areas over the next 12-18 months, Texon entered into a gas purchase agreement with a Texas based company, Laser Midstream. Texon Petroleum Limited (ASX:TXN) advises that it has finished drilling and casing its second Eagle Ford well. Strong oil and gas shows were observed throughout the 4,500ft of horizontal drilling within the Eagle Ford reservoir similar to the oil and gas shows in the first Eagle Ford well that has just been tested. Production casing has been run in preparation for the fracture stimulation which has been contracted and is expected to begin in March. After this work has been completed, the well will be production tested. Texon Petroleum Limited (ASX:TXN) advises that its first Eagle Ford well, Tyler Ranch EFS #1H, has flowed 1,267 boepd representing 1,202 bpd of light sweet crude oil and 782 mcfpd of gas with a flowing tubing pressure of 2610 psi through a 16/64" choke. Some of the frac fluid is also still being recovered. Fracture stimulation and testing of Texon Petroleum Limited&apos;s (ASX:TXN) (PINK:TEXOF) first Eagle Ford lateral well (TR EFS #1H) commenced on Thursday 2 December, 2010 (Houston time). The Eagle Ford reservoir has become a premium resource play evidenced by the 657 Eagle Ford drilling permits that have been granted in the first 9 months of 2010, compared with 94 for the whole of 2009. Texon Petroleum Limited (ASX:TXN) advises that its second Eagle Ford lateral well, Mosman-Rockingham EFS #1H, has drilled vertically to a depth of 3,311m (10,865ft) and has encountered oil and gas shows in the Eagle Ford Shale. 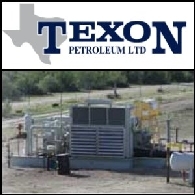 Texon Petroleum Limited (ASX:TXN) advises that it has recently sold 375 mcfgpd, nett to the Company, of non-core Frio dry gas production and 5 Frio prospects for US$286,000. The Company continues to focus its efforts and capital towards the liquids rich Eagle Ford and Olmos reservoirs in McMullen County Texas. Texon Petroleum Limited&apos;s (ASX:TXN) second Eagle Ford horizontal well (MR EFS #1H), located in the Company&apos;s Mosman/ Rockingham lease, commenced drilling on 12 November 2010. It is expected that the well will take 35 days to drill. Fracture stimulation and testing of this well are scheduled for January next year. The Company has a 100% Working Interest (75% Net Revenue Interest) in the well. Texon Petroleum Limited&apos;s (ASX:TXN) first Eagle Ford horizontal well (TR EFS #1H) referred to in our release of 25 October is now scheduled to begin fracture stimulation work about the 15th of November, with results anticipated in the second half of November. Texon&apos;s second Eagle Ford horizontal well (MR EFS #1H) which was the subject of our announcement on 15 October is now scheduled to begin drilling operations in 7 to 14 days. Texon Petroleum Limited (ASX:TXN) advises that the recently drilled Nambucca well has tested gas at the gross rate of 442 mcfgpd from the Yegua reservoir through a 10/64" choke at 750 psi. Texon Petroleum Limited (ASX:TXN) advises that it has finished drilling its first Eagle Ford well (TR EFS #1H). Strong oil and gas shows were observed throughout drilling 4,500ft horizontally within the Eagle Ford reservoir. Texon Petroleum Limited (ASX:TXN) advises that the recently drilled Lennox well has tested gas at the gross rate of 921 mcfgpd from the Yegua reservoir through a 10/64" choke at 2,502 psi. Texon Petroleum Limited (ASX:TXN) advises that it has contracted a rig for its second Eagle Ford horizontal well, Mosman-Rockingham EFS #1H (MR EFS #1H), which will be drilled on its Mosman/Rockingham leases. Texon Petroleum Limited (ASX:TXN) advises that the Tyler Ranch EFS #1H well has drilled into the Eagle Ford Shale at the depth of 3,252m (10,670ft) and has encountered good oil and gas shows. Texon Petroleum Limited (ASX:TXN) advises that the first Eagle Ford well on its Leighton Project, Tyler Ranch EFS #1H, has commenced drilling and is expected to take about 30 days to reach its total depth. Texon Petroleum Limited (ASX:TXN) ("Texon") advises that the recently drilled seventh well on its Leighton Project, (Tyler Ranch #6) has begun to flow oil and gas at the gross rate of 350 boepd from the Olmos reservoir (comprising 205 bopd and 880 mcf of gas per day) through a 10/64" choke at 2000 psi. Texon Petroleum Limited (ASX:TXN) Lennox #1 well is currently at a depth of 1,180ft preparing to set surface casing. The well is anticipated to take 7-9 days to complete drilling. In the Leighton Eagle Ford project area Texon Petroleum Limited (ASX:TXN) has a 70% WI in 874 acres with two joint venture partners (Global Petroleum Limited and Excellong Inc.) having 15% WI each. Adjacent to this holding Texon holds an average of 96% WI in a further 777 Eagle Ford acres, making a total of 1,651 acres. Texon Petroleum Limited (ASX:TXN) advises that Tyler Ranch #6 ("TR#6") has reached its total depth of 2,774 metres (9,100 feet). This is the seventh well in the Leighton oil and gas field - all of which have been successful. Texon Petroleum Limited (ASX:TXN) advises that the seventh Leighton Olmos well, Tyler Ranch #6, commenced drilling on 1st August, 2010 and is currently at a depth of 70 metres. The well has a planned total depth of 2,743 metres (9,000 feet) and will take about 12-15 days to drill. Texon Petroleum Limited (ASX:TXN) is pleased to release its June 2010 Quarterly Report. Texon Petroleum Limited (ASX:TXN) plans to drill two Olmos Wells And two Yegua Wells. Texon Petroleum Limited (ASX:TXN) has located a drilling rig for two (2) Eagle Ford wells with an option for a third (3rd) Eagle Ford well. Texon advises that it has entered into a binding agreement to sell a 20% WI in the Leighton Field Olmos reservoir for US$6.7 Million to a USA based oil and gas company. After the sale, Texon&apos;s retained WI in the 1,280 acres of Olmos reservoir at Leighton will average 59%. Texon Petroleum Limited (ASX:TXN) announces that it has successfully completed a placement of 40.6 million shares to sophisticated and institutional investors at an issue price of A$0.35 per share to raise approximately A$14.2million. The price represents a discount of 12.3% to the 5 day average price of the Company&apos;s shares traded prior to the Company requesting a trading halt. Texon Petroleum Limited (ASX:TXN) advises that a horizontal Eagle Ford well drilled by Swift Energy Company 1 1/2 miles (2.5km) from Mosman-Rockingham has flowed 1,134 bopd and 1.1 mmcfgpd (1,310 boepd). This is an important well as it indicates that the Eagle Ford Shale ("EFS") in the Leighton-Mosman-Rockingham-Sutton ("LMRS") leases (see attached map) could be oil productive. Texon Petroleum Limited (ASX:TXN) advises that its first "Olmos" well on Mosman-Rockingham has flowed at an initial rate of 111 boepd (comprising 100 bopd and 65 mcf of gas per day) through a 8/64" choke. Texon Petroleum Limited (ASX:TXN) advises that the sixth well on its Leighton Project, Tyler Ranch #5, has begun to flow oil and gas at the gross rate of 445 BOEPD (Barrels of Oil Equivalent Per Day) from the Olmos reservoir (comprising 420 bopd and 150 mcf of gas per day) through a 8/64" choke. Texon Petroleum Limited (ASX:TXN) advises that it has farmed out three (3) gas prospects with Yegua and Frio reservoir targets. Texon Petroleum Limited (ASX:TXN) advises that Tyler Ranch #5 ("TR#5") has reached its total depth of 2,743 metres (9,000 feet). It is now planned to run production casing in the well after which the well will be fracture stimulated (in the next 10-14 days) and then the well will be connected for oil and gas production. Texon Petroleum Limited (ASX:TXN) advises that it has secured a 100% Working Interest (WI) in a 320 acre lease adjoining the northern boundary of Leighton. The new lease contains two deep wells drilled in 1984 and 2000 respectively. Wireline logs indicate 131ft of potential oil and gas pay in the Eagle Ford Shale, an additional 50ft of potential pay in the overlying Lower Austin Chalk and 5ft in the Olmos reservoir. Texon Petroleum Limited (ASX:TXN) advises that the sixth Leighton well, Tyler Ranch #5, commenced drilling on 7 April 2010. The well has a planned total depth of 2,743 metres (9,000 feet) and will take about 12-15 days to drill. The well will penetrate the Olmos reservoir at approximately 2,676 metres (8,780 feet), which is the same oil and gas reservoir as is producing in the first five Leighton wells (Peeler #1, Tyler Ranch #1, Tyler Ranch #2 , Tyler Ranch #3 and Tyler Ranch #4). Tyler Ranch #5 is located 335 metres north of Tyler Ranch #2. Texon Petroleum Limited&apos;s (ASX:TXN) first well (Mosman-Rockingham #1) on its Mosman-Rockingham project, reached a total depth of 3,466 metres (11,370 feet) on 29 March, 2010, after intersecting oil and gas shows in the Olmos and Eagle Ford Shale reservoirs. There are 157ft of Olmos and Eagle Ford Shale in the well. ABN Newswire stocks to watch today include: Murchison Metals Limited (ASX:MMX) (PINK:MUMTF), Burleson Energy Limited (ASX:BUR), Texon Petroleum Limited (ASX:TXN) and Adelaide Energy Limited (ASX:ADE) (PINK:ADEZF). Texon Petroleum Limited (ASX:TXN) advises that its first Mosman-Rockingham well, (MR#1 or Hoskins Unit #1), has encountered 200ft of oil and gas shows in the Eagle Ford reservoir and in the underlying Buda Limestone at a depth of 3,404 metres (11,168 feet). This is in addition to the oil and gas shows from the Olmos reservoir referenced in the Company&apos;s release dated 26 March 2010. Texon Petroleum Limited (ASX:TXN) advises that its first Mosman-Rockingham well, (MR#1 or Hoskins Unit #1), has encountered oil and gas shows in the Olmos reservoir at the expected depth of 2,806 metres (9,205 feet). The oil and gas shows in MR#1 are of the same type as and are over a thickness similar to the Olmos reservoir at Leighton where Texon has 5 Olmos producing wells. 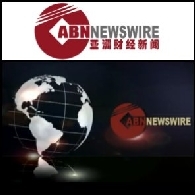 ABN Newswire stocks to watch today include: Marion Energy Limited (ASX:MAE) (PINK:MAEJF), Iron Road Limited (ASX:IRD), Conquest Mining Limited (ASX:CQT) (PINK:CQMLF), Pan Asia Corporation Limited (ASX:PZC), Clean Global Energy Limited (ASX:CGV), Texon Petroleum Limited (ASX:TXN), and AuDAX Resources Ltd (ASX:ADX) (PINK:ADXRF). Texon Petroleum Limited (ASX:TXN) 2009 year end proved and probable reserves are respectively 1.9 mmboe and 1.1 mmboe - a total of 3.0 mmboe as to the Company&apos;s current working interests. From mid year 2009, this is an increase of 40% and from year end 2008, the increase is 200%. Texon Petroleum Ltd (ASX:TXN) advises that the first well on its 3,270 acre Mosman-Rockingham leases - Mosman-Rockingham #1 (MR #1 or Hoskins #1), commenced drilling on 15 March 2010. MR #1 will be a vertical well to a planned total depth of 3,490 metres (11,450 feet) and will investigate the presence and characteristics of the Olmos and Eagle Ford reservoirs in the Mosman-Rockingham leases. Texon Petroleum Ltd (ASX:TXN) has a 70-100% WI in 4,500 acres of leases over its Leighton-Mosman-Rockingham projects, where there are two reservoir targets. Texon Petroleum Ltd (ASX:TXN) advises that following the re-fraccing of the Tyler Ranch #1 well and remedial work on other wells in the Leighton field that the Company&apos;s nett production from all of its wells (including Leighton) has increased to 535 boepd, up 40% from the mid January rate of 378 boepd in the Company&apos;s December quarterly report. Texon Petroleum Limited (ASX:TXN) has mandated the Commonwealth Bank of Australia (the "CBA") through its wholly owned subsidiary Texoz E&P II, Inc. to explore financing options to develop the Company&apos;s Leighton field over the next several months. The CBA is a leading provider of upstream oil and gas financing with a dedicated oil and gas team with offices in Australia and North America. Texon Petroleum Limited (ASX:TXN) is pleased to provide the Quarterly Report for the period ended 31 December 2009. ABN Newswire stocks to watch today include: Otto Energy Limited (ASX:OEL) (PINK:OTTEF), Focus Minerals Limited (ASX:FML), Texon Petroleum Limited (ASX:TXN), Dynasty Metals Australia Limited (ASX:DMA) and Mission NewEnergy Limited (ASX:MBT) (PINK:MIBFF). Texon Petroleum Limited (ASX:TXN) advises that it plans to commence drilling the first Mosman-Rockingham ("MR #1") well in late February. MR #1 lies some 8 kilometres (5 miles) south of the Leighton Field and will be drilled to a depth of 3,414m (11,200ft) to test the Olmos and Eagle Ford reservoirs, both of which are oil and gas productive in nearby wells. Texon Petroleum Limited&apos;s (ASX:TXN) fifth Leighton Olmos production well was deepened below the Olmos to investigate the Eagle Ford Shale. The well had oil and gas shows during drilling the Eagle Ford and there were also oil and gas shows in the Buda and Edwards Limestone (below the Eagle Ford). Texon Petroleum Limited (ASX:TXN) reports that the fifth Leighton production well (Tyler Ranch #4) has flowed 480boepd from the Olmos reservoir comprising oil and gas at the rates of 410bopd and 425mcfgpd through a 10/64" choke at a flowing surface pressure of 2150psi. Texon Petroleum Limited (ASX:TXN) advises that it has acquired a further 1,835 acres at 100% working interest over the Rockingham Prospect located 9 kilometers to the south west of Leighton and contiguous with the Mosman Prospect. Texon Petroleum Limited (ASX:TXN) revenues received for the quarter and the year to date before severance tax and lease operating expenses were US$0.92 million and US$2.90 million, respectively. Cash proceeds from gas and oil sales are received two months after production and sales take place, so that the revenue received for the quarter is from production during May, June and July. The average oil and gas market prices during the quarter were about US$65/barrel and US$3.25/mcf, respectively. Increased production from Leightons 3, 4 and 5 since July will result in increased revenue in the December quarter this year and the first quarter of 2010. Texon Petroleum Limited (ASX:TXN) advises that the fifth well on its Leighton project, Tyler Ranch #4, has reached a total depth of 3,359 metres (11,019 feet) after intersecting oil and gas shows in the Olmos and Eagle Ford Shale reservoirs. Texon Petroleum Limited (ASX:TXN) advises that the fifth well on its Leighton project, Tyler Ranch #4, has encountered oil and gas shows in the Olmos reservoir at a depth of 2,701 metres (8,860 feet). The oil and gas shows in Tyler Ranch #4 are over an interval which is similar to the first four Leighton production wells (Peeler #1, Tyler Ranch #1, Tyler Ranch #2 and Tyler Ranch #3). Texon Petroleum Limited (ASX:TXN) advises that the fifth Leighton well, Tyler Ranch #4, commenced drilling on 10 October 2009. The well has a planned total depth of 3,444 metres (11,300 feet) and will take about 20-25 days to drill. The well will penetrate the Olmos reservoir at approximately 2,703 metres (8,870 feet), which is the same oil and gas reservoir as is producing in the first four Leighton wells. Texon Petroleum Limited (ASX:TXN) advises that the fourth well on its Leighton Project, Tyler Ranch #3, has begun to flow oil and gas at the gross rate of 500 boepd from the Olmos reservoir comprising 377 bopd and 746 mcf of gas per day through a 12/64 choke, at a flowing pressure at the surface of about 2,600 psi. This flow rate exceeds the initial flow rates of the previous 3 Leighton wells. Texon Petroleum Limited (ASX:TXN) advises that the Share Purchase Plan (SPP) which was announced on 14 August and closed on 16 September has raised A$5.9m. Shareholders applied for 31,055,454 shares at an issue price of 19 cents which was discounted by 19%. The offer was underwritten by RBS Morgans (formally ABN AMRO Morgans) up to A$2.95m. Texon Petroleum Limited (ASX:TXN) advises that the fourth well on its Leighton project, Tyler Ranch #3, has reached a total depth of 2,743 metres (9,000 feet) after intersecting oil and gas shows in the target Olmos reservoir. The Olmos reservoir properties as indicated by wireline logs in Tyler Ranch #3 are similar to the first three Leighton production wells (Peeler #1, Tyler Ranch #1, and Tyler Ranch #2) all 3 of which are producing oil and gas from the Olmos. Texon Petroleum Limited (ASX:TXN) advises that it plans to drill a fifth Leighton Olmos production well and that the well will be deepened to investigate whether the Eagle Ford Shale contains producible oil and gas at Leighton. Texon Petroleum Limited (ASX:TXN) advises that the first well on its Leighton prospect - Peeler #1 has tested oil and gas at an unstablized rate of approximately 400 barrels of oil equivalent per day (boepd) comprising some 250bopd and 900 mcf of gas per day and 90 barrels per day of water through a quarter inch choke at a flowing pressure at the surface of about 1,500psi. Texon Petroleum Ltd (ASX: TXN) - New Float and Company Update - Mr David Mason, CEO; Texon Petroleum Ltd (ASX: TXN) present the following audio webcast regarding "New Float and Company Update". You may also download this audio webcast to your computer or portable audio player.